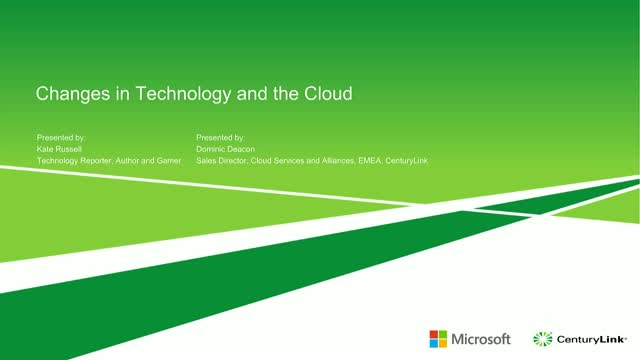 Kate Russell, Technology reporter, author and Gamer discusses changes in Technology in the Cloud with Dominic Deacon, Sales Director, Cloud Services and Alliance of CenturyLink. Throughout this webinar you will hear the latest trends and thoughts around how technology is changing and how the Cloud can improve businesses as well as steps to influence and manage change. Organisations on the journey to digital transformation are encountering new challenges with managing risk. Not only are complex digital transformation initiatives making it difficult for organisations to fully grasp their entire risk profile but digital transformation is also resulting in new types of risk for the company. Organisations with strong risk aversion are in danger of preventing or stifling innovation and change. How can organisations manage risk and create a strategy that empowers digital transformation? What have organisations learned on the road to digital transformation that can help others early on in the journey? Digital transformation is real, and it’s happening – our data in the retail industry lends more insight to the state of the transition. It is an inescapable truth that every business is becoming a digital business empowered by new software initiatives such as AI, Robotics and IoT. The adoption of these disruptive trends will force a divide between business leaders and laggards. With the upcoming Black Friday and Cyber Monday, how prepared are you to meet rising customer expectations. As the pace of innovation accelerates, retailers need to act now. Our Global retail research illustrates a significant gap between digital leaders and laggards and even a modest investment can improve operational efficiencies and agility. Join 451 Research and CenturyLink to discuss how enterprises are choosing and deploying digital transformation initiatives for business gain. This webinar will focus on the strategies and actions impacting the European market. Organisations of all sizes and in every sector are busy redefining their IT priorities for a digital future, identifying the goals of enhanced customer experience, operational efficiency, business agility and improved risk management as four key pillars for their digital transformation strategies. Digital transformation can play out differently depending on a company’s maturity, the vertical sector in which it operates, its employees, its infrastructure, and its ability to innovate. Knowing where to start, and how to maintain momentum is critical. - Understand how companies with more progressive digital transformation strategies are prioritising their efforts for competitive differentiation, changing the nature of their business with innovative technologies, and making service provider choices to accelerate results. - Gain insights and recommendations from a major survey of the IT priorities of enterprises in Europe. - Identify the key shifts in business context that will continue to shape digitisation efforts, and how these need to be reflected in a digital transformation roadmap for IT organisations. CenturyLink provides solutions that combine a comprehensive portfolio of network and IT services with industry best practices to help organisations in their digital transformation. The company’s consultative approach helps customers determine and implement the best execution venue for key applications so they can optimize the productivity of their strategic digital initiatives. CenturyLink offers expertise in multi-cloud management, hosted SAP solutions, data analytics, cybersecurity services, and IT consulting.